Welcome to the homepage for Jeffrey Jensen Arnett, Ph.D.
Dr. Arnett’s main area of scholarship is emerging adulthood, the age period from the late teens to the mid-twenties. Dr. Arnett coined the term and presented a theory of emerging adulthood in a widely-cited article in American Psychologist in 2000. According to Dr. Arnett, in the past half century what most people experience during the years from age 18 to 29 has changed dramatically in industrialized societies. 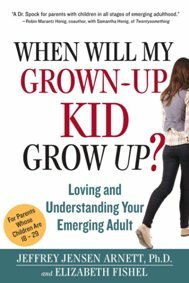 Instead of entering marriage and parenthood in their very early twenties, most people now postpone these transitions until at least their late twenties, and spend their late teens through their mid-twenties in self-focused exploration as they try out different possibilities in love and work. Essentially, a new developmental stage has been created between adolescence and young adulthood. Scholarly attention to this period has boomed in recent years, and it is now widely referred to among scholars as emerging adulthood. On the 10th Anniversary of the publication of his groundbreaking work, the second edition of Emerging Adulthood fully updates and expands Arnett's findings and includes brand new chapters on media use, social class issues, and the distinctive problems of this life stage. em>RRead more about this title. Download the Preface to the Second Edition and Chapter 1. I do a lot of public speaking, and I have often had parents approach me after my talk and thank me... Read more about this title. Download the Introduction and Chapter 1. 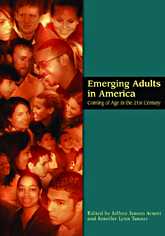 This book resulted from the 1st Conference on Emerging Adulthood held at Harvard University in November, 2003. Twelve scholars contributed... Read more about this title. The psychology of emerging adulthood: What is known, and what remains to be known? Download this chapter (pdf). Emerging adulthood: Understanding the new way of coming of age. Download this chapter (pdf). Young people today wait longer than ever before to marry and become parents. What is going on in their lives from their late teens through their twenties, between the time they leave their... Read more about this title. Download this chapter (pdf). The new life stage of emerging adulthood: An international perspective. With R. Žukauskienė and K. Sugimura. Download this article here (pdf). The emergence of emerging adulthood: A personal history. Emerging Adulthood. Download this article here (pdf). Conceptions of adulthood among migrant women workers in China. (With J. Zhong). Download this article here (pdf). Confessions of a heretic: My unlikely career as a so-called psychologist. (Brooks-Gunn, J., Lerner, R.M., Petersen, A.C., & Silbereisen, R.K., Editors). Download this chapter here (pdf). The Evidence for Generation We and Against Generation Me. Download this article here (pdf). The Dangers of Generational Myth-making : Rejoinder to Twenge. With K. Trzesniewski, & B. Donnellan. Download this article here (pdf). Early Adulthood in a Family Context: New York: Springer. (A. Booth & N. Crouter, Editors). Download this chapter (pdf). Bridging cultural and developmental psychology: New syntheses in theory, research, and policy. (L. A. Jensen, Editor). Download this chapter (pdf). Oh, grow up! Generational grumbling and the new life stage of emerging adulthood. Download this article (pdf). 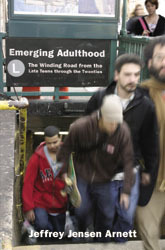 The emergence of "emerging adulthood': The new life stage between adolescence and young adulthood. Download this article (pdf). Emerging adulthood: Learning and developing during the first stage of adulthood. (M. C. Smith & T. G. Reio, Editors). Storm and stress redux. Download this article (pdf). A fraught passage: The identity challenges of African American emerging adults. Download this article (pdf). From "worm food" to "infinite bliss": Emerging adults' afterlife beliefs. (R. W. Roeser, R. M. Lerner, & E. Phelps, Editors). Download this article (pdf). Emerging Adulthood: What is it, and what is it good for? Download this article (pdf). Emerging adulthood, a 21st century theory: A response to Hendry and Kloep. Download this article (pdf). Socialization in emerging adulthood: From the family to the wider world, from socialization to self-socialization. (J. Grusec & P. Hastings, Editors). Download this article (pdf). The long and leisurely route: Coming of age in Europe today. Download this article (pdf). Suffering, selfish, slackers? Myth and reality on emerging adults. Download this article (pdf). The case for emerging adulthood in Europe: A response to Brunner. Download this article (pdf). The myth of peer influence in adolescent smoking initiation. Download this article (pdf). The developmental context of substance abuse in emerging adulthood. Download this chapter (pdf). Culture and conceptions of the transition to adulthood. Download this article (pdf). A congregation of one: Individualized religious beliefs among emerging adults. Download this article (pdf). Conceptions of the transition to adulthood: Perspectives from adolescence to midlife. Download this article (pdf). Ideological views in emerging adulthood: Balancing the ethics of autonomy and community. Download this article (pdf). Emerging adulthood: A theory of development from the late teens through the twenties. Download this article (pdf). High hopes in a grim world: Emerging adults’ views of their futures and of “Generation X.” Download this article (pdf). Learning to stand alone: The contemporary American transition to adulthood in cultural and historical context. Download this article (pdf). Young people's conceptions of the transition to adulthood. Download this article (pdf). Copyright © 2006, Jeffrey Jensen Arnett, Ph.D.